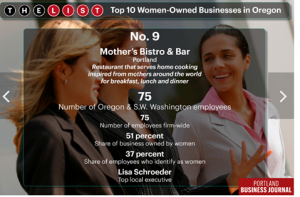 So proud of us, being chosen as one of the top ten women-owned businesses in Portland! Couldn’t do it without the patronage of you, our wonderful guests! Thank you for all your support over these past 16 years! 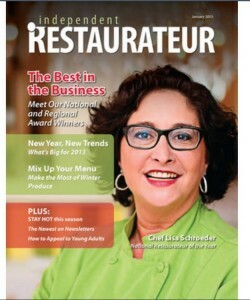 So proud of our very own Chef Lisa for being selected as National Restaurateur of the year by “Independent Restaurateur” magazine! What an honor! Read the article HERE or click on the picture to find out more. Congrats to Mother’s Bistro & Bar on its selection as an Honorable Mention recipient of the 2012 Alfred P. Sloan Awards for Excellence in Workplace Effectiveness and Flexibility! As an honoree, Mother’s Bistro & Bar has distinguished itself as a leading employer of choice that is successfully using flexibility as part of an effective workplace strategy to achieve business goals and benefit employees by helping them meet their responsibilities on and off the job. The two-step selection process is rigorous, involving an evaluation of employers’ programs and practices, and a confidential employee survey. As an Honorable Mention recipient of the 2012 Sloan Awards, your organization ranks in the top 20% of employers nationally in terms of its programs, policies and culture for creating an effective and flexible workplace. In addition, what makes this honor so special is that employees have corroborated this, affirming that yours is indeed an effective and flexible workplace.